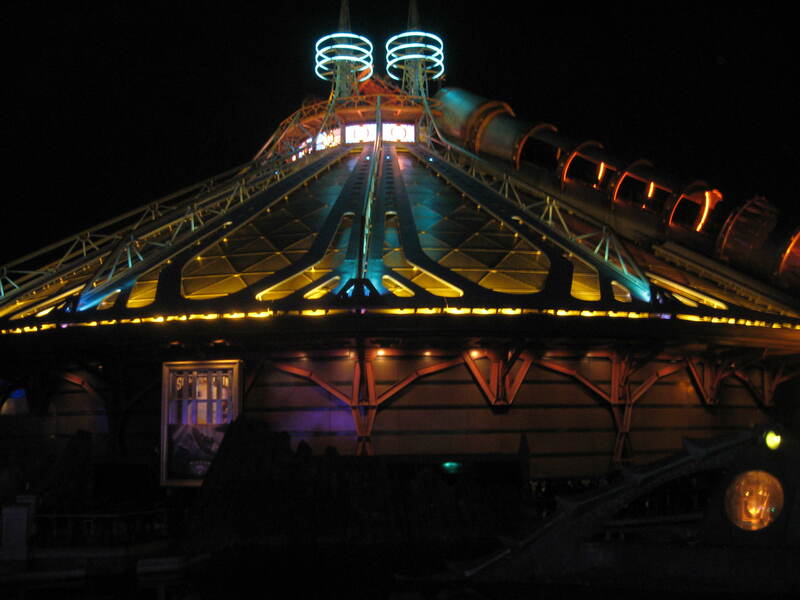 1995 saw the opening of what may be the ultimate enclosed coaster: Space Mountain: De la Terre a la Lune. It was designed by Tim Delaney and his team at Walt Disney Imagineering and they took the classic John Hench concept and evolved it. 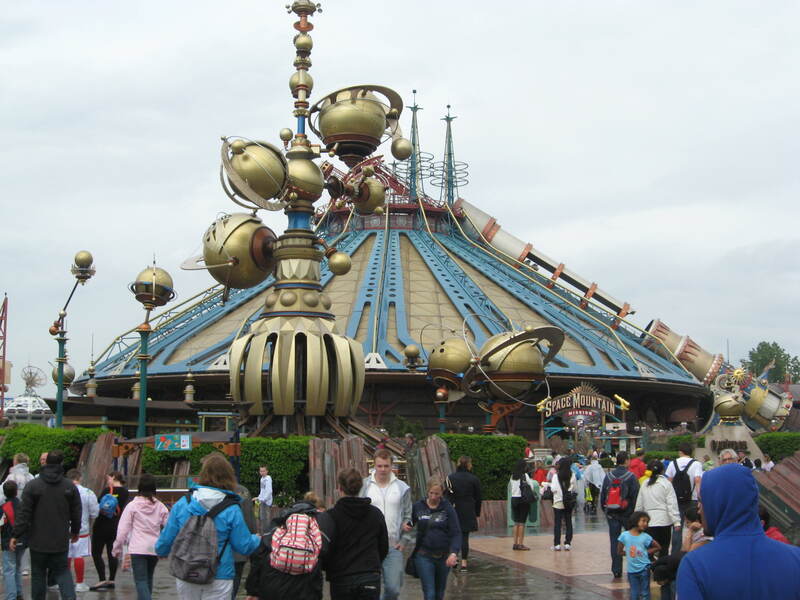 For Disneyland Paris (Chessy, France), a prime location was reserved in the middle of Discoveryland and thus, guests would be able to walk around it and see it from up close. The original concept for Discovery Mountain, as it was then known was huge. The massive, at least 300 feet wide Mountain would house the roller coaster, a large lagoon with the Nautilus submarine anchored in it, a restaurant and even a large freefall attraction patterned after the famed novel “Journey to the Center of the Earth”. 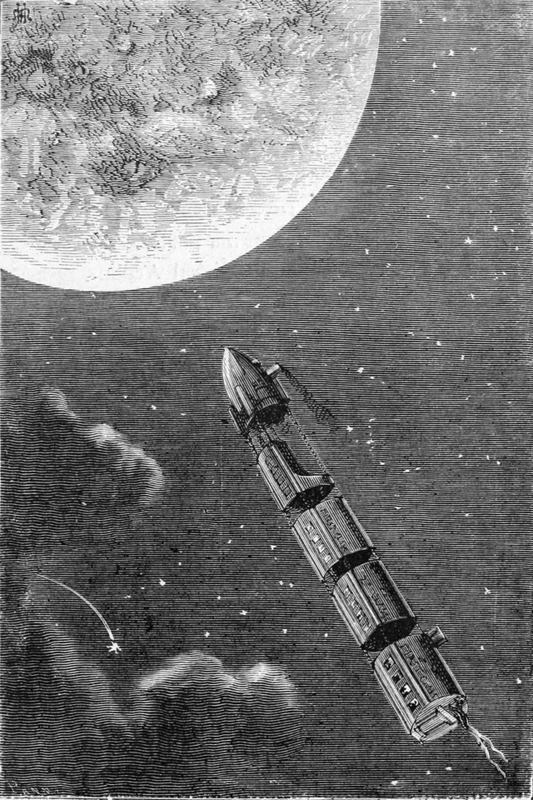 The roller coaster itself drew its inspirations from two other Jules Verne novels: From the Earth to the Moon and Around the Moon. The novels, written in 1865 for the first one and 1869 for the second part went like this: after the American Civil War drew to a close, the members of the Baltimore Gun Club, all incredible gunsmiths and gunners who thrived to design the largest and most powerful cannons for the Union in the war, are bored and restless. The president of the Gun Club, Colonel Impey Barbicane seriously proposes for them to expend their energy by designing a large cannon…. To send a shell to the Moon. In the most recent editions of the novel, this picture show one of the piece of art used to illustrate the novel. It is very clear looking at the “train” of shells travelling toward the moon that it is one of the main inspiration behind the ride. The second novel details the orbit around the Moon and its subsequent return to Earth. So, for his attraction, Tim Delaney read both novels and drew elements to design the attraction. Eventually, budgets were revised due to the troubled opening of what was then Euro Disneyland and the project revised to include a 200 feet wide mountain that would house the roller coaster. The Nautilus and his lagoon (also from another Jules Verne novel, 20000 Leagues under the Sea) were relocated outside and placed in front of the Columbiad. In the novel, the Columbiad was dug into the ground and made of cast steel. It was impractical to dig a 200 feet deep hole for the attraction, so a new Columbiad was created. The Paris Columbiad stand 105 feet tall and is angled at 32 degrees. It lay on the side of the mountain and has beautiful gold leaves covering the Archer, Sun and other various decorative elements. It has a silver trap door near the bottom and intricate gear work throughout. The three above pictures show the Columbiad. Notice the large silver trap door and various elements that help continue the story of the roller coaster. 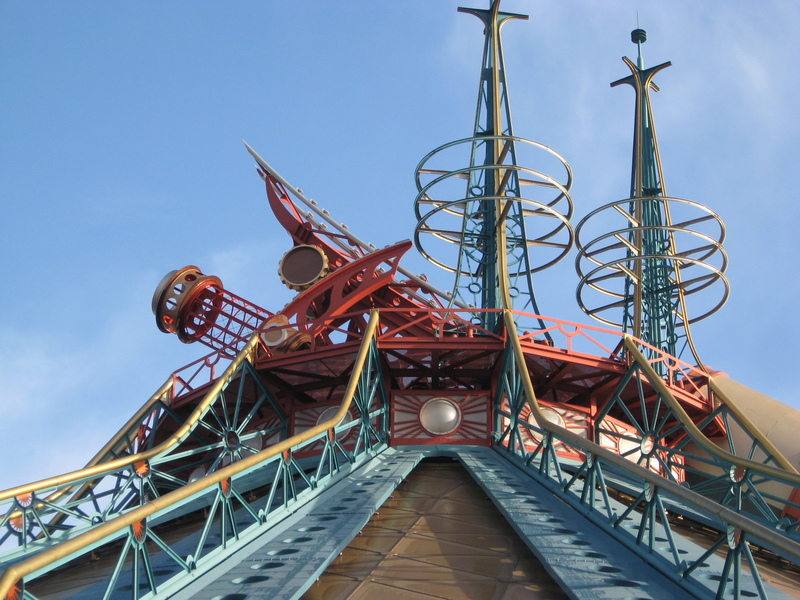 The mountain itself is 141 feet tall and has more decorative elements on the top, such as green neon lights and what appears to be a continuation of the launch track. A unique element was the fact that that a giant open walkway went through the middle of the mountain and was divided in two: the right side was the waiting line and the left side, the Stellar Way. The Stellar Way was open to everyone and allowed people a glimpse inside the adventure that would await brave Space Travelers. The mountain in the background looking from the hub. The various theming elements on the mountain top. The mountain is one of the most beautiful attraction in the world at night. The lighting is absolutely perfect and bring out the colors and tones of the building. This picture shows the large poster that stood in the front of the mountain. It explained the story and what we will experience. 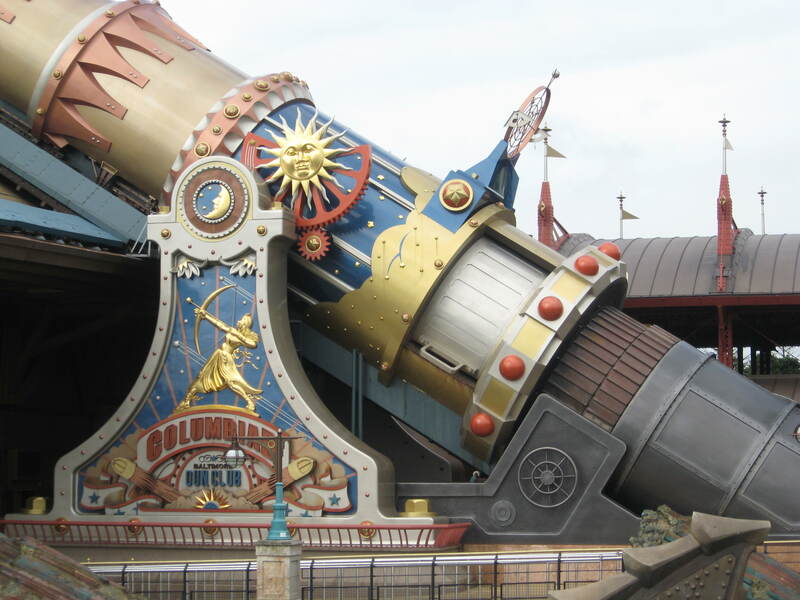 The experience started with the entrance near the Orbitron Flying Machines. After guests go under the entrance portal, they go through the waiting line and enter a covered tunnel near the Columbiad. 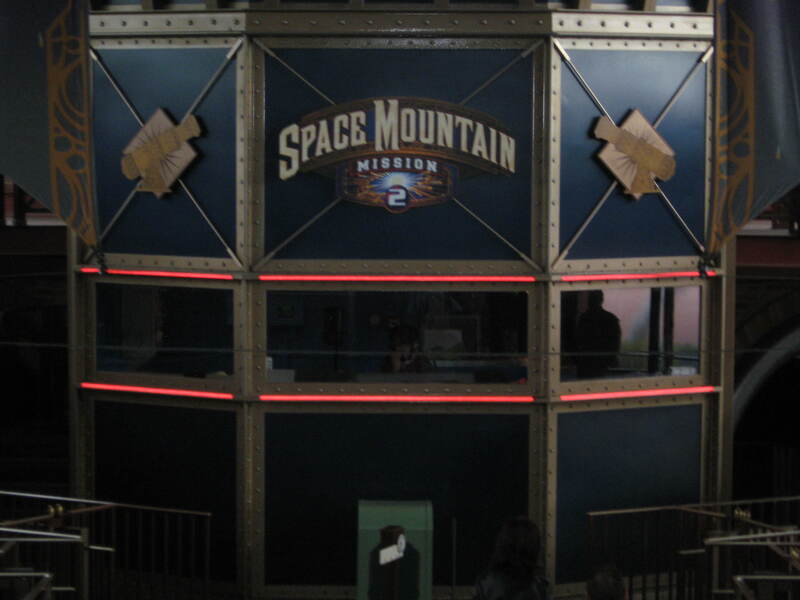 This leads to the indoor waiting line where riders can see the Shell Trains fly around them in space and view various things such as the Blue Moon Mining Company and a Galaxy. We eventually reach the “Electro de Velocitor” and periodically, we see red lights turn on and soon after, a Shell Train is slowed down as it returns to Earth in a loud bang. 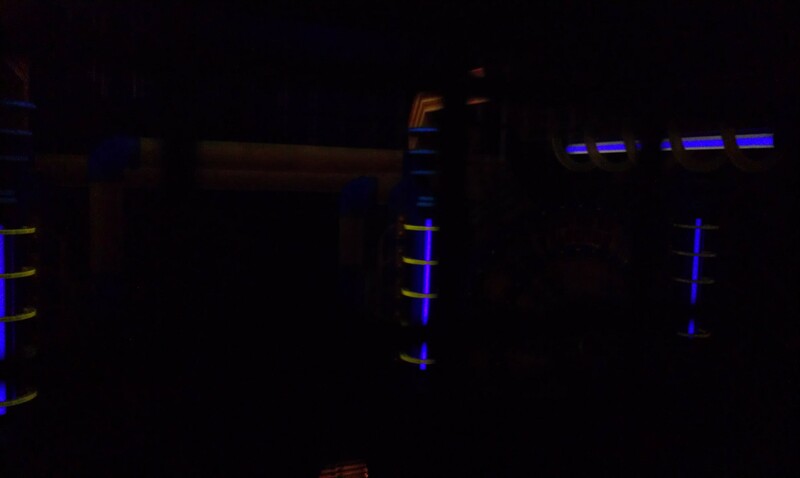 This dark picture show the Electro de Velocitor from the waiting line. We then go up metal stairs and arrive in the Baltimore Gun Club Lounge area, where a safety video is projected. If you look around, you can see various drawings of what awaits us. On the ceiling star map, various dates are listed of both real and fictional space missions and mixed in are the initials and birthdates of the Imagineers who created the attraction. Quotes in French of the novel are also written on the walls. Drawing of the Columbiad in the Lounge. We leave the Lounge and arrive at the Gun Depot after going under a sign that say in Latin “Ad Luna in Flamma Gloria”. It means “To the moon in a blaze of glory” in latin. We enter the gun depot and went around an extended waiting line which was housed on an elevated walkway around the sides of the Depot. 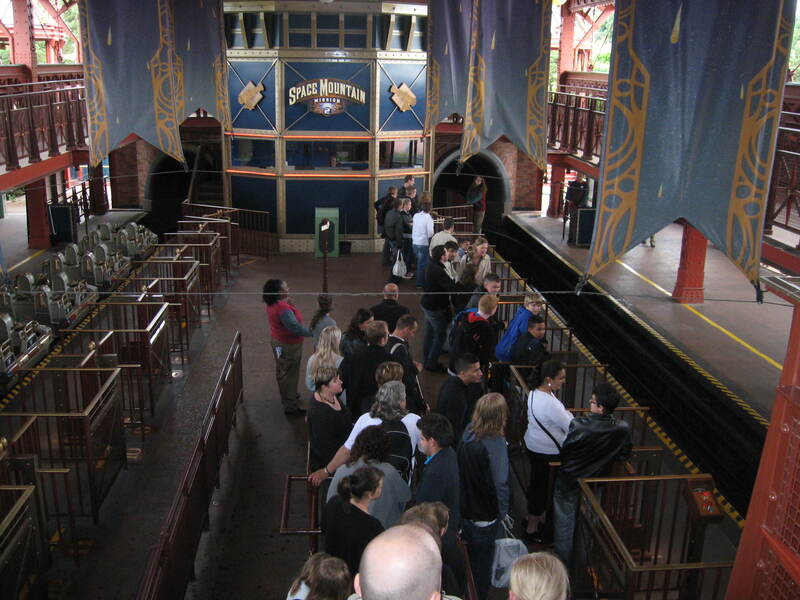 The line then split in two, as two loading platforms are used for this attraction. In front of us as we go down is the ride Control Tower, where a cast member sit and monitor the attraction. We are assigned a row in one of the 6 24 seats Shell Train and interestingly, until 2005 no air gates were present. Air gates are automatic gates that prevent access to the track area from the waiting line until the train is parked and can safely be boarded. They are an industry standard, but Disney were the last ones to adopt them, as they tend to slow the boarding process down. The trains were beautifully crafted and had a greenish bronze tone. 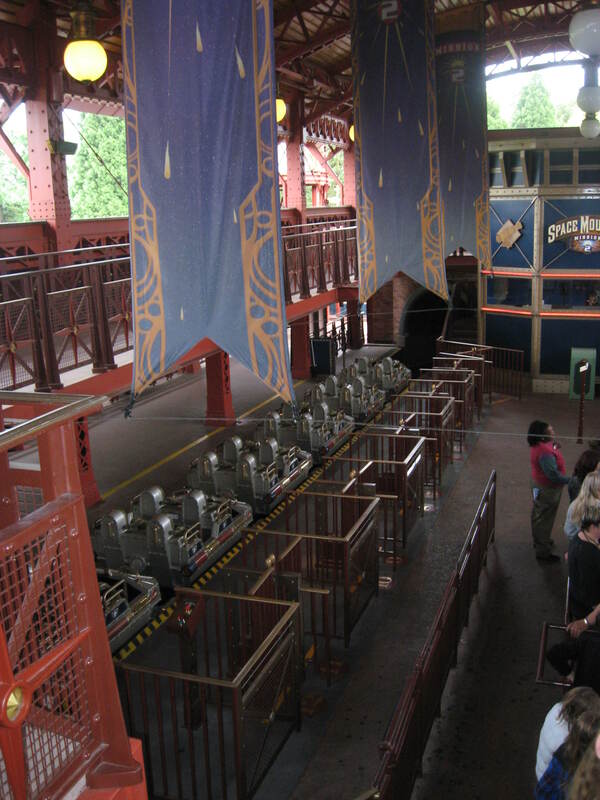 As a unique feature for this type of ride, grab bars for the front row of each car were built in. The front is shaped like a steam punk rocket and large “DM” crests were built in the side bars. After each guest is seated, cast members quickly verify each shoulder restraint and once the go is given, we start our adventure. In this picture from 2001, you can see the original front of the train. Notice the rich details and “DM” crest. The train leaving the station. One important part of the attraction is music. Music composer Steve Bramson composed a fantastic soundtrack that is played through 6 speakers in every seat. The music is stored on solid state drives which are played by an onboard computer that is mounted behind the last row in the extended 6th car. Sensors throughout the layout trigger each music sequence, as it was divided in “zones” so it would always be choreographed with the ride. For power, a bus bar is mounted in each station and the train is charged up during load. The train exits the station and goes around a metal tube to the right. It then sharply drops into the Columbiad and a technical description of the launch system and sequence can be seen here: https://parkvault.net/2014/12/23/from-the-earth-to-the-moon-and-the-suspended-looping-coaster-part-4-of-the-vekoma-story/ . The original launch sequence went like this: after the train is stopped at the bottom, the Sun would rotate clockwise on its gears and thus open the trap door. Our train was then loaded in the cannon” and the sun would rotate back counter clockwise to close the trap door as we went up in a puff of smoke. Once at the launch position, the music would build the tension and without warning… we were launched to 32 mph in 1.5 seconds. Riders experienced 1.5 G’s and at the same time: the cannon would retract as if the forces had pulled it back and a huge cloud of smoke would be released for the train to go through. Red neon lights in the cannons would flash all around us and viewers would see the green lights on the roof flash. The track extension would also flash with strobes, thus giving the illusion the train was gone and had flown off in the sky. The train reached the Catapult crown and then dropped back in, diving to the left. The train followed the side of the mountain and all throughout that journey around the mountain, we would see black lit large meteorites, asteroids as well as the Moon. It was illuminated in a pale blue light. Eventually, we would dive under the walkway and go up into the Sidewinder inversion. This half loop-half corkscrew maneuver would even have a large asteroid in the middle. With the lights on, you’d realize that the top of the Sidewinder nearly touch the ceiling of the mountain. After the Sidewinder, our train is sucked by the Blue Moon Mining Company “Moon Sweeper”. This beautiful prop as a moving broom and various lights and is seen from the waiting line. The train goes up in a rising right hand 270 degrees turn. The train is then slowed down as it “smashes” into the “MOM”, which is short for “Mother of Meteorites”. The train goes through the glowing melting core of the MOM in a shower of spark and start going to the right in a dense asteroid field. It eventually dives down under the waiting line staircase and is twisted around in a smooth Corkscrew that has a near barrel roll shape. Note that the mountain extends far underground and the maintenance workshop and other facilities are also in the basement. So, the Corkscrew had a specially designed room built to go around it with cut outs for safety clearance! After the Corkscrew, the music take a triumphant turn and rises up in an elevated right hand turn over the waiting line. The train then start going up the B lift and at the top, you can see the Moon, who smiles at us. It is similar in style to the Moon in the 1902 George Melies (one of the father of Cinema) film “Le Voyage dans la Lune”. Alas… like in the novel, we never reach the moon and instead drop to the right in a dramatic tone. We turn close to the ground to the right and do a small hill in the middle of an asteroid, which is known as the Spark Trench. It carries its name well as sparks from hidden Industrial Spark generators would shoot off to the side as we went. The ride then goes up against the wall in the “Tongue Loop”. It is an overbanked turn where our train nearly flips us over and then we go over the Galaxy we saw in the waiting line. The train then dive into a trench where black lit stripes accentuate speed as we reach the ride maximum speed of 44 mph is reached. It then rises up into the Electro de Velocitor and is slowed down in a loud bang. It then returns triumphal to the stations. Shortly before the ride opening, for marketing purposes, the ride was renamed. It went from “Discovery Mountain” to “Space Mountain: De la Terre a la Lune”. But, you could still see many references in the waiting line, signs and trains of the original name. The attraction safety signs still feature the original attraction name initials. Christopher Columbus: The Discovery (1992 movie) opening titles. It was composed by Cliff Eidelman. Krull—Love Theme (1983. It was composed by James Horner. 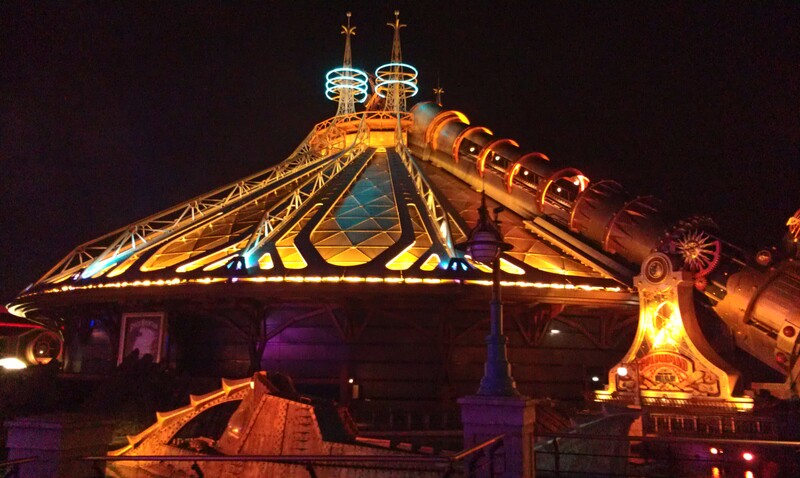 Space Mountain Impressions. This was the slower version of the ride soundtrack and Steve Bramson also added to it. Shooting Stars. I was unable to find any information about this piece. Christopher Columbus: The Discovery— At Sea. The Rocketeer — Flying Circus (1991 film). This was composed by James Horner. Always—Main theme (1989 film). This was composed by John Williams. The Rocketeer End Titles is still used at the resort, in the Walt Disney Studios Front Lot. 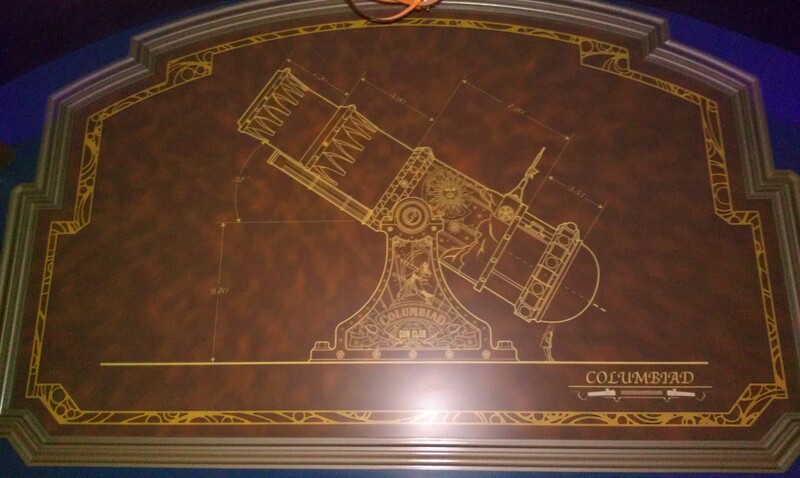 It is also present at Walt Disney World in the waiting line of Soarin’ at Epcot. The ride was an incredible success and brought incredible crowds to the park. Unfortunately, a few of the effects broke down quickly. The Sun and the various gear rotations broke down after a month and do not move anymore. The trap door is now a seasonal effect. It is due to the launch system not liking the cold draft the open trap door brings into the electric motor room in winter. The smoke is made of water vapor and it has been very unreliable since 2001. The red and green neon lights burned out in 2000-2001. The Spark Trench pyros were quickly removed as well. Due to the ride roughness, the audio system is now unreliable as the vibrations shake it apart. 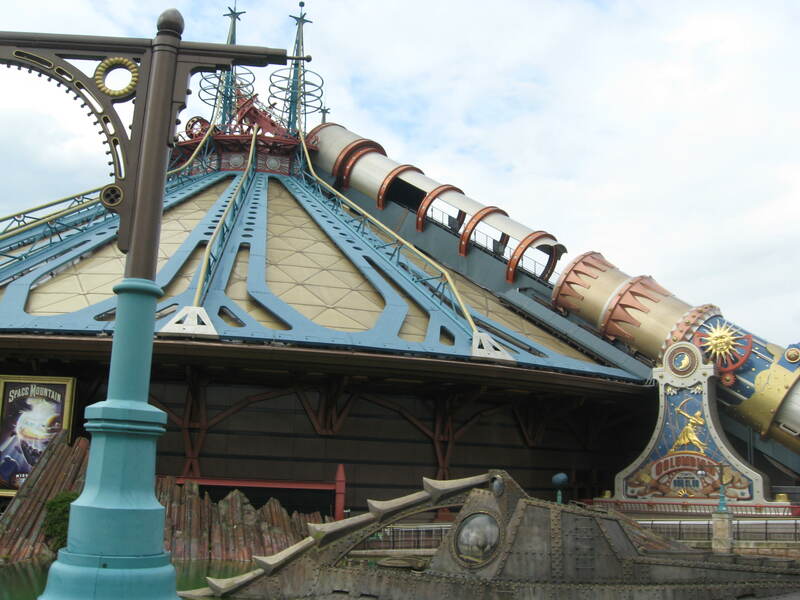 In 2000, The Voie Stellaire was closed to accommodate the new Fast Pass entrance. The original voie stellaire entrance was used for guests holding Fast Pass tickets and proceeded to the Lounge area. Stand-by guests were held at the entrance of the mountain and the cast member there allowed a few guests in at a time depending on how busy Fast Pass Return was and how many trains were running. A camera showing the entrance to the lounge assisted with that. 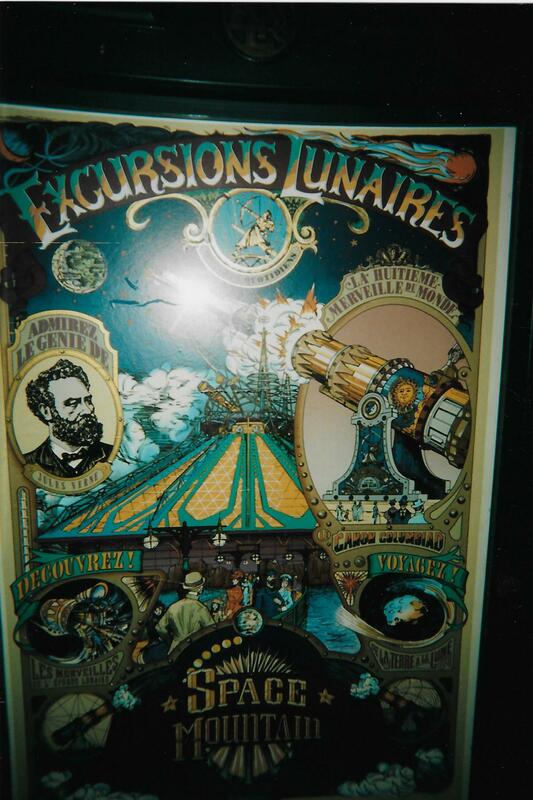 So in 2005, the ride closed for a 3 months refurbishment period. 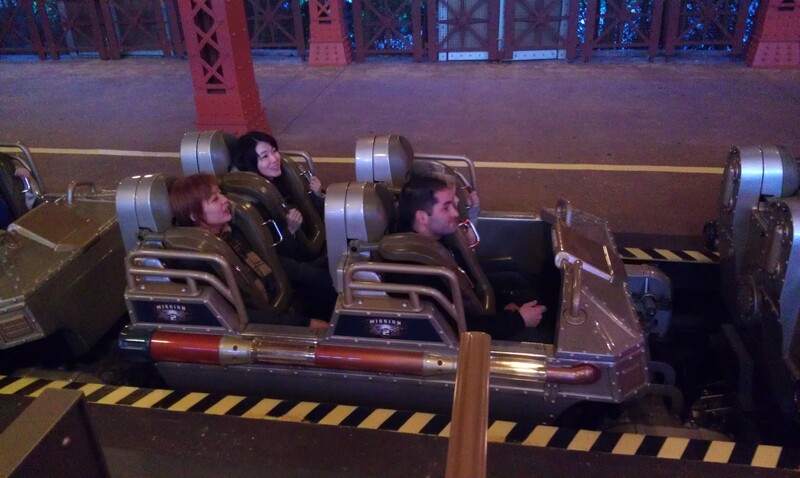 During that time, the trains were rebuilt with the updated sound system from Rock n Roller Coaster. The “DM” crests were removed and the cars repainted to a silver tone. The Columbiad and metal tunnel had its windows blocked and lights added to the bottom. The launch now took place from the bottom and a countdown synchronized with the new lights added to the soundtrack. 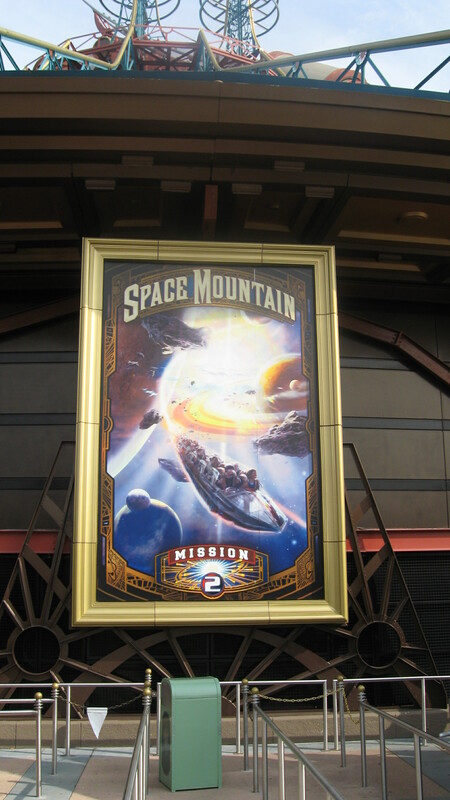 Large waiting line poster for Mission 2. The Mission 2 Gun Depot. Notice the dual loading stations. 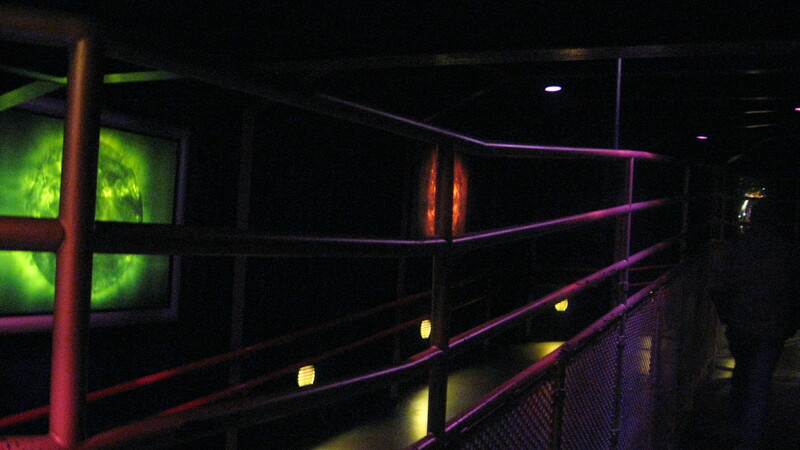 The air gates were added in the 2005 refurb. The control tower was repainted and redressed. The Mission 2 rocket car. 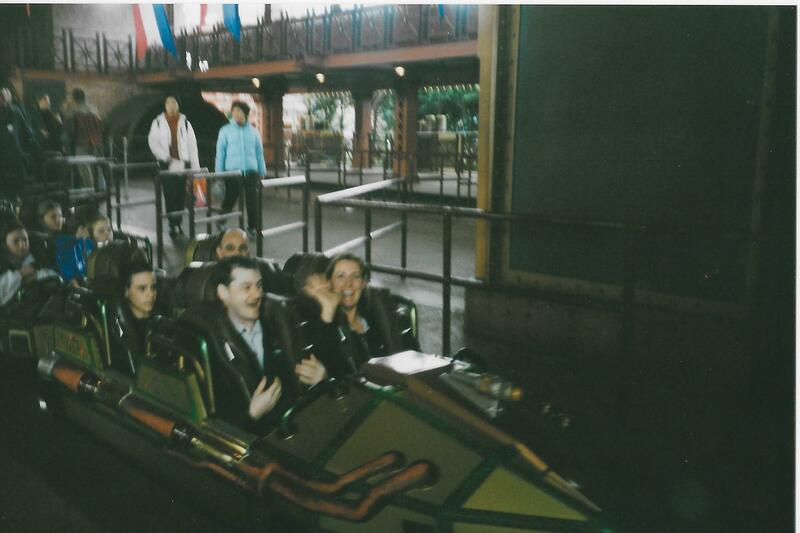 Notice the restraint: it opened with standard Vekoma restraints, then went to this model with added foam near the ears. Then, they reinstalled the original restraint with soft cloth padding covered by leather near the ear area. Then, for Mission 2, returned to the added foam ones. 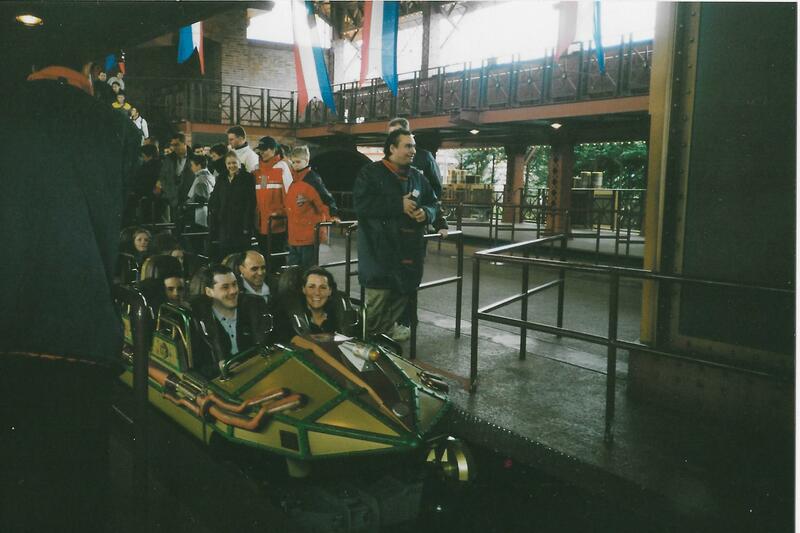 Unique among Vekoma and Arrow trains is the fact that the manual release for the restraints is behind the car. You can see the black pedal between the cars. The soundtrack was changed to a new faster song from Michael Giacchino, another famous movie soundtrack composer. 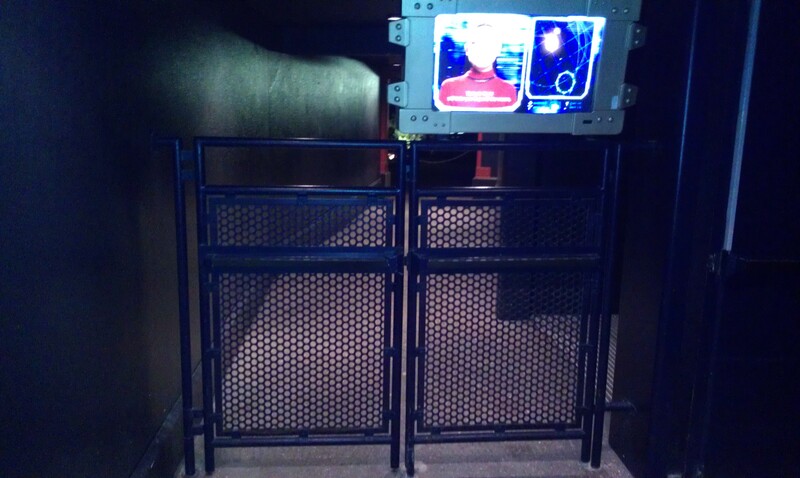 Ride wise, the Blue Moon Mining Company was removed and various clear screens installed. 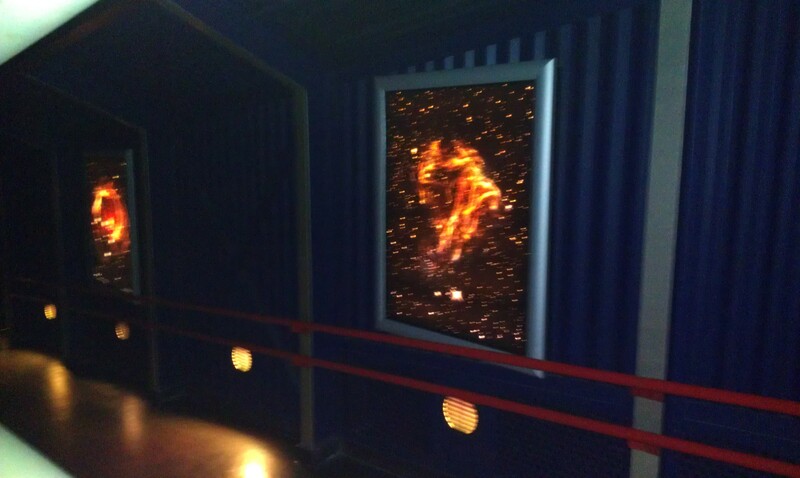 Various effects are projected on those screens and a Star Field similar to the other Space Mountain installed. The trench at the end had red neon’s installed around it. The spark trench got a sparkling red light effect installed on it. In the cannon, variable lights were added to Mission 2. Those are the strips you can see. The largest change was that since we were now going “Beyond the Moon” in this “Mission 2”, the Moon was removed and replaced by the same exploding Super Nova projection that appeared in Hong Kong later in 2005. The Fast Pass management and indoor waiting line configuration was changed. Guests from both lines now merged near the original Fast Pass return entrance and thus, the rethemed and fully enclosed now indoor waiting line is again in use. This is the original point where guests from the Standby line were stopped. The Mission 2 waiting line. All the original Voie Stellaire windows were enclosed and those Space pictures hung in their place. 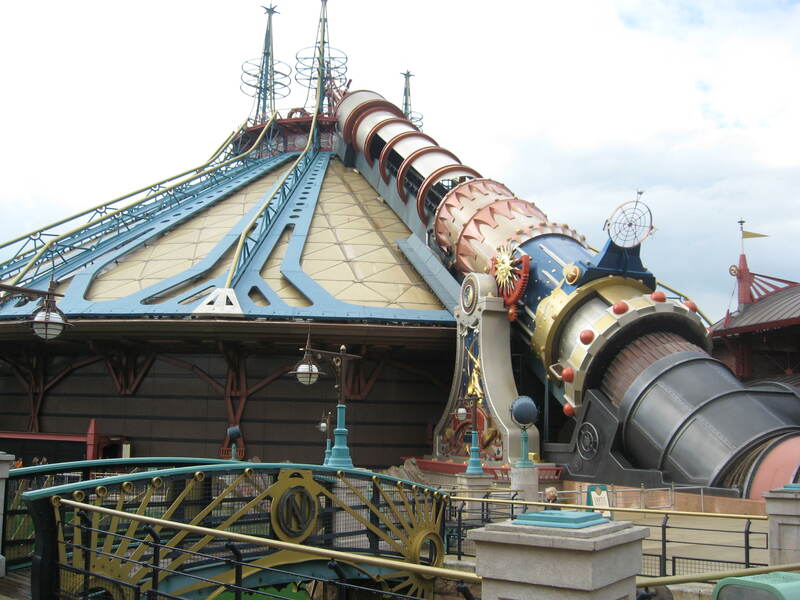 The original waiting line music loop was replaced by more generic space music and noises. The changes got a mixed reception and the ride again closed for a refurbishment on January 14th 2015. The planned closure is longer as it is currently scheduled to reopen only in August this time. Disneyland Paris has not released any details at this time as to what will be changed or what the new name will be. 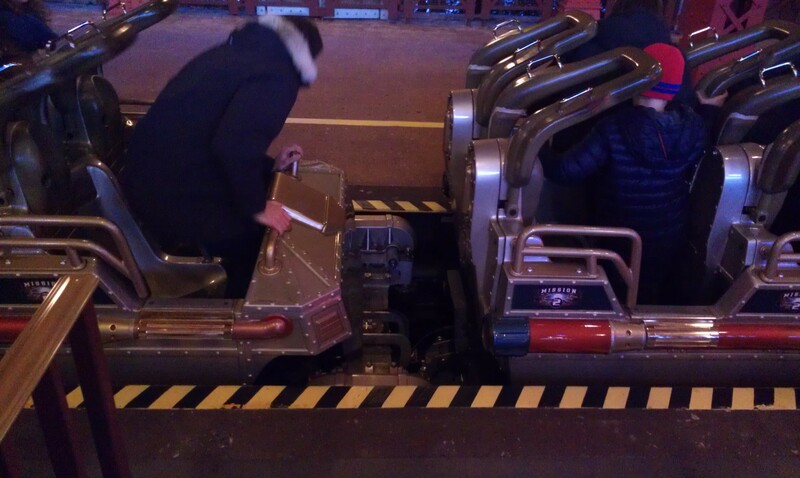 This entry was posted in Coasters and tagged Columbiad, de la terre a la lune, Discoveryland, Disneyland Paris, Electro De Velocitor, Jules Verne, Mission 2, Space Mountain, Tim Delaney, Vekoma. Bookmark the permalink. ← A Dragon and the Las Vegas Strip: part 5 of the Enclosed Coasters History.